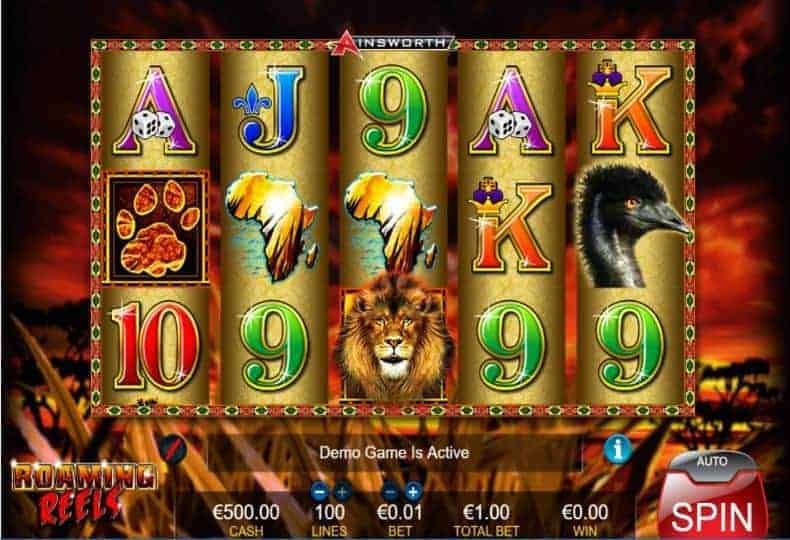 Every slot maker in the world seems to include an African Safari based game and here it is, The Roaming Reels slot game, by Ainsworth Gaming. The game has become, in just a short space of time, really quite popular in Las Vegas. Roaming Reels is a 5 reel, 100 pay-line slot machine by Ainsworth Gaming. The game features a safari theme, with it's highest paying symbols represented as the map of Africa, zebras, emus and antelopes. The main feature in the Roaming Reels slot is a classic free spins bonus. Land 3, 4 or 5 Scatters anywhere on the reels and you will win 8, 12 or 20 free games respectively. During the bonus, you get extra wilds and can re-trigger the game multiple times. The lion assumes the role of 'Wild' which lands on the reels 3, 4 and 5 during the base game whereas the acacia tree is the Scatter, which re-triggers the bonus. Within the feature, Lion Wild symbols appear on the reels 1, 3 and 5 - these Lions substitute for all regular symbols and so you have a much better chance of hitting a big win. Whenever you land 3 or more Scatters during free games, an additional 5 free spins will be awarded. During both the base and bonus game, the top paying symbol is the map of Africa which, if you get a 5-in-a-row, will award 1,000 coins. When you place 5 Scatters on the reels, you will win 100x your total bet. The maximum potential win on any spin is 100,000 credits. Players from New Zealand and Australia can enjoy the Roaming Reels pokie in various online casinos. Though the term is different (pokie as opposed to slot), the game is absolutely identical to the Las Vegas version. As for the UK market, Roaming Reels is referred to as a fruit machine or slot, and again, it comes with all the same gameplay and features as the Vegas version. Clearly, it's not just the theme, or the shiny polished graphics and sound that makes the game (although these aspect certainly help), but the gameplay itself, which is about as good as it gets for what is a standard 5x3 slot game.